Uglyworld #74 - Red Wage Goes Loopy Lou, originally uploaded by www.bazpics.com. Red Wage has been acting a little strange all day, but until this evening his behaviour could have been passed off as at least semi-normal. Around midnight however he slipped over into the loopy side, he came wandering out of the bedroom wearing what I can best describe as a lunatic costume (fashioned from tinfoil which he obviously sneaked out of the kitchen earlier). 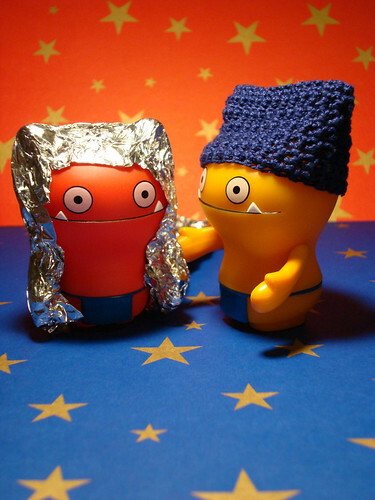 Wage asked him what the hell he was doing, and Red Wage just replied, "It's the sun dude, it's sending gamma rays at us with increased levels of whatchamacallits and thingymajigs tonight, you should get a foil suit on too!!!"